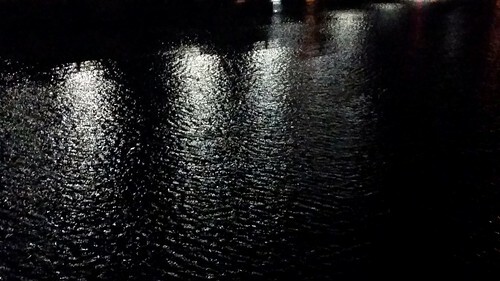 The river water at night on a windy evening. This is one of those photos that can't even come close to what it was that I saw, which is too bad because it was pretty cool. What you see in this photo is the water with ripples and light. But when in motion, the wind with the water and lights made it look as if the water was sparkling and alive. I'm sure some people have seen this ample times or find nothing fascinating about it, but I can't help but think about how much more that makes the water appear filled with life--it gives another sense of being to something that we largely think of as innate. We use it to keep our lawns clean, keep ourselves hydrated and to clean ourselves, but sometimes, water too can have its own essence.